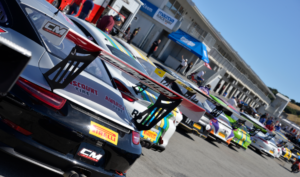 Monterey, Calif. – It was once again the hometown BR Racing team that delivered a dominant performance at Mazda Raceway Laguna Seca on Sunday in Race 6 of the 2016 Pirelli GT3 Cup Trophy USA championship. 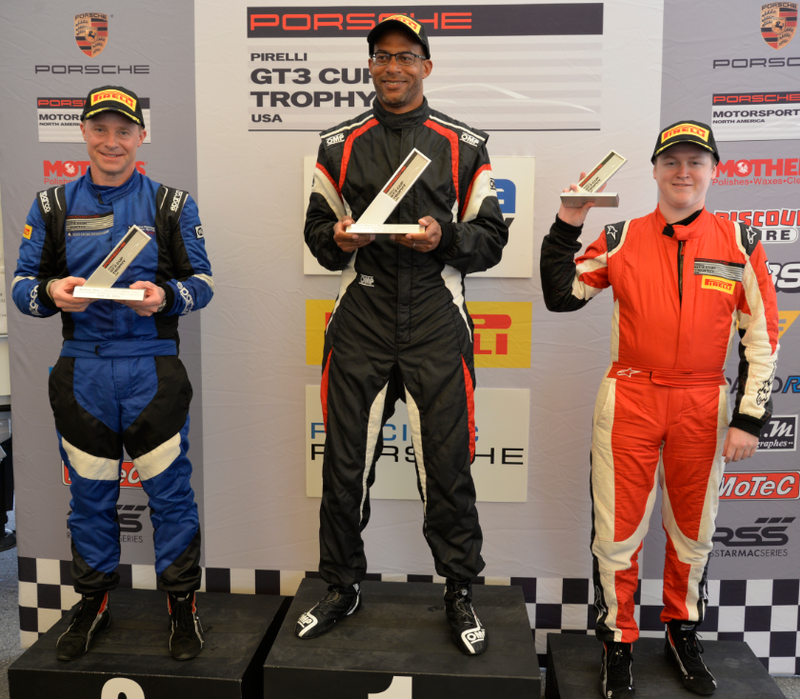 Robert Todd took a commanding victory in the Diamond class, with Kevin Woods scoring a win in the Silver division with his No. 94 Santa Cruz Porsche Cayman ClubSport GT4 for BR Racing. 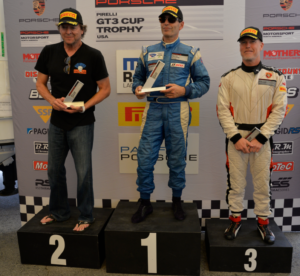 The team was also represented on the Platinum class podium as Jim Walsh scored third after starting from pole. 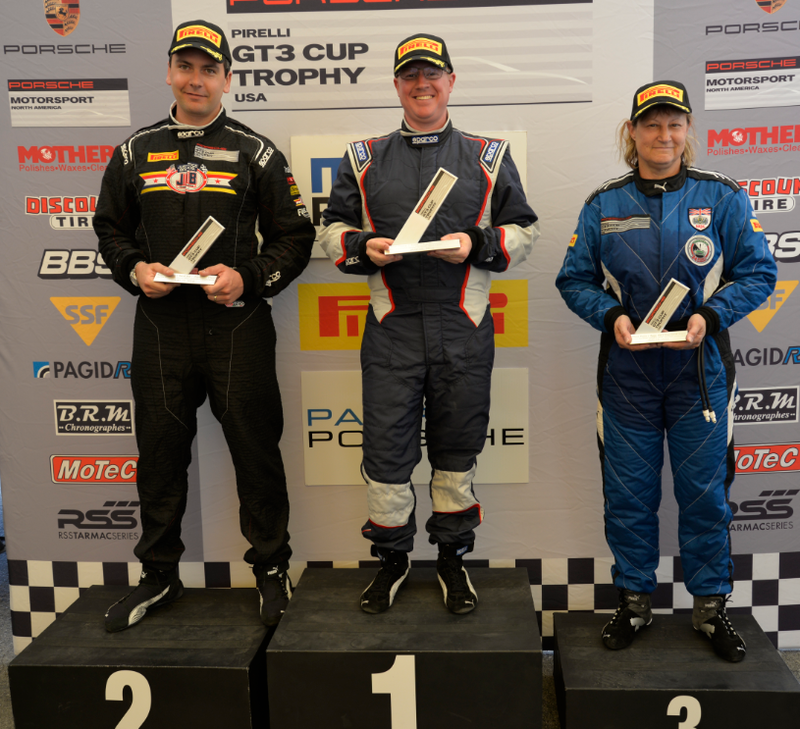 Todd opened Race 6 from the pole position and pulled out a gap over TruSpeed Autosport’s Jason Godfrey, who had started on the pole on Saturday in Race 5. The race ran caution-free for the first 28 minutes with Todd developing a healthy advantage over the entire field. Despite a late-race caution that set up a green-white-checkered scenario with just minutes remaining in the race, Todd held on to the lead with Godfrey taking the runner-up position and Desire Wilson scoring third for her second podium finish of the Mazda Raceway Laguna Seca weekend. 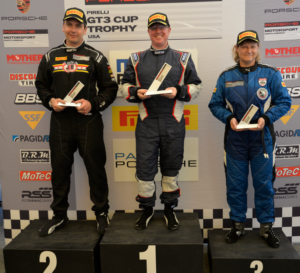 There was a familiar face atop the Platinum class podium as TruSpeed Autosport’s Tom Haacker took his fifth victory of the year in a convincing win at the Northern California circuit. Rounding out the Platinum podium was Rob Tachovsky driving for GAS Motorsports and BR Racing’s Jim Walsh. 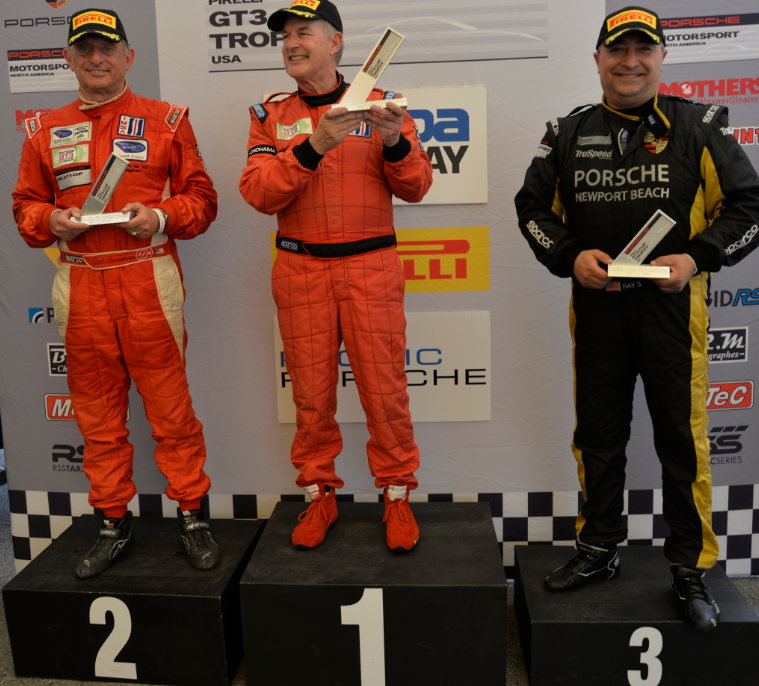 It was Joe Sposato who came out on top in the Platinum Masters division which was another solid run after he drove his No. 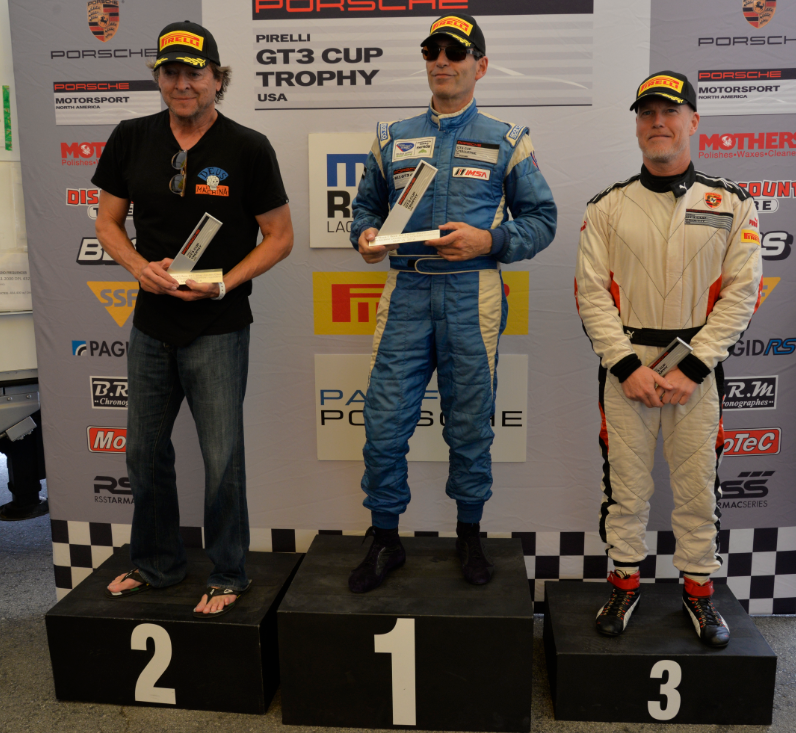 28 Allstar Fire Equipment/Scott Air Pak Porsche to a third place podium finish on Saturday. 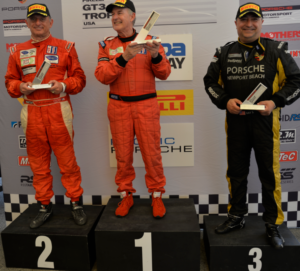 Robert Rodriguez of P7 Racing followed up his victory on Saturday with a runner-up result on Sunday, while TruSpeed Autosport’s Ray Shahi finished third, also taking a double-podium result which marked a tremendous comeback after a disappointing previous round at The Thermal Club when mechanical issues plagued his No. 65 Sterling Collision Porsche. 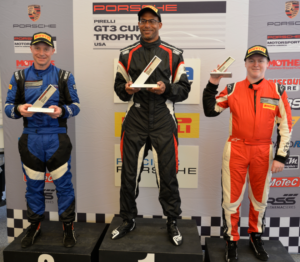 The Silver Class podium reflected a wide range of experience with a previous Pirelli GT3 Cup Champion in Kevin Woods winning the race ahead of Rolex 24 overall champion David Donohue, and with Sean McAlister taking the third step of the podium, having scored third in just his sixth-ever race. Steve Goldman once again ran away with the Silver Masters victory, taking his fourth consecutive winning result in the No. 1 Seek Thermal Porsche entry. 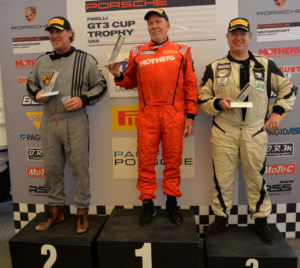 Pacific Porsche driver Mike Sullivan delivered his second podium result of the weekend with a runner-up finish and rounding out the Silver Masters podium was Thomas Mayerhoffer who delivered a remarkable run in just his first-ever race weekend. 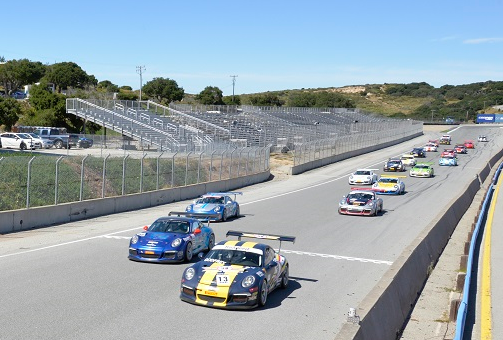 Competent Motorsport President Greg Franz, was pleased with the Mazda Raceway Laguna Seca event which saw nearly 40 cars competing. The Pirelli GT3 Cup Trophy USA competitors will be able to take what they learned this weekend and apply it again in three weeks when the series returns to the Monterey road course June 3-5. This entry was posted in News on May 15, 2016 by admin.